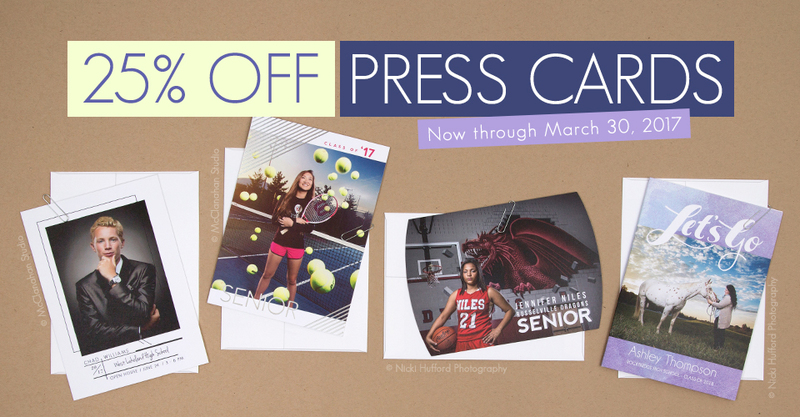 Now through March 30th, enjoy 25% off Press Cards in ROES and Designer Plus. Just in time for graduation season, you can save on premium Announcements, Invites, Thank Yous and more. As always – you will receive your Cards in as little as 24 hours. Please Note: This offer applies to Accordion Cards, Flat Luxe Cards, Foil Pressed Cards, Folded Foil Pressed Cards, Folded Luxe Cards and Luxe Pop Cards through ROES and Designer Plus. All Business Cards are not eligible. The sale price will not be reflected in order summaries or email confirmations. The discount will only appear after the order is transmitted and received by the lab. Offer expires at 11:59 p.m. on March 30th.